1) Splitting XLR signals for taking a recording directly off a house mix. 2) Sending mixed signals to multiple amp racks. 3) Splitting XLR signals between house and monitor mixers. 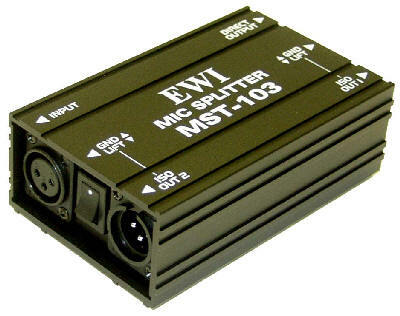 4) Multiple XLR feeds for broadcast. 1) Durable construction and is housed in a tough extruded aluminum case. 2) Balanced XLR inputs and outputs. 3) Ground lift switches on both of the Isolated Split Outputs. 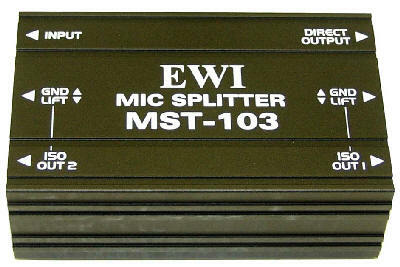 4) Good quality transformer for the split. 5) The Direct Out will pass Phantom Power. The two isolated split output do not pass phantom power. On the left end is the input jack and one isolated output with the ground lift switch next to the isolated output. On the right end is the direct out plus one more isolated output panel jack plus ground lift switches for second isolated split. Physical properties are: The width is 5.108". The height is 1.730". The front to back measurement is 3.196”. There are 4 nice little rubber feet on the bottom to help keep if from sliding around on a slick surface, or marring up something you set it on. Weight is 1.00 lbs. 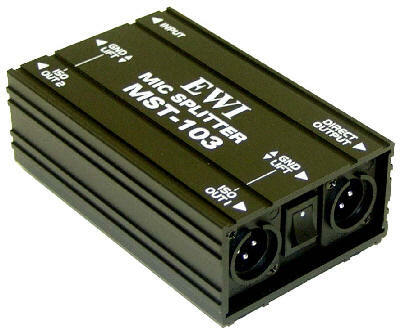 The extruded aluminum case is constructed with slots and extrusion so multiple MST-103 or the EWI LDB-101 can be fitted together semi permanently. This is a passive device, so no active power is required. As well as being durable, the all-metal construction further helps to reduce induced EMI into the unit. The panel jacks are constructed with plastic bodies, and the FXLR input jack is constructed with spiral spring contact points with no locking device other than the solid fit of the spiral spring contacts.